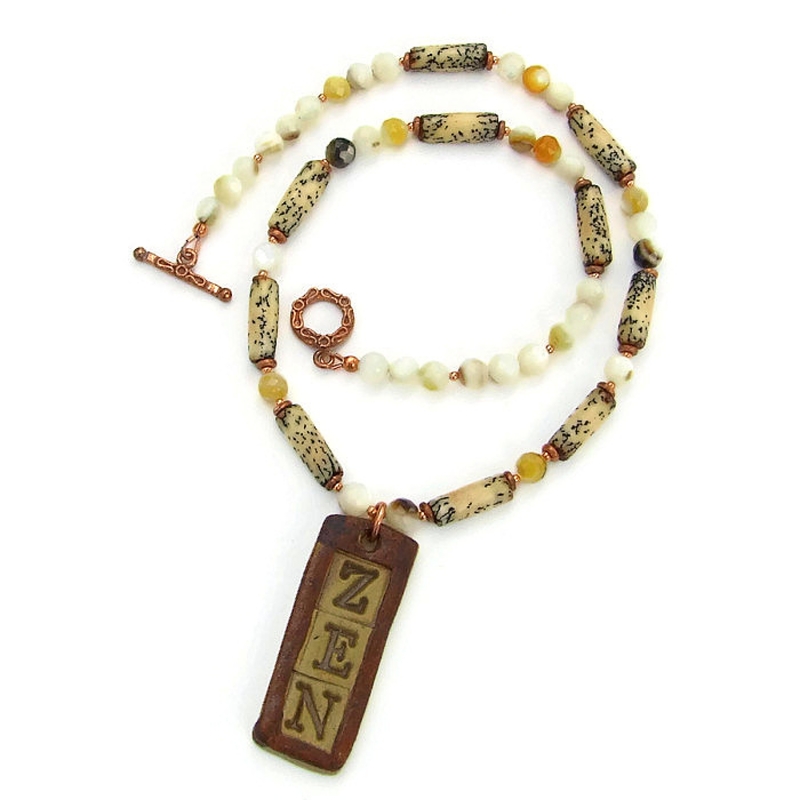 What a perfect piece of jewelry for the woman who meditates / practices yoga! 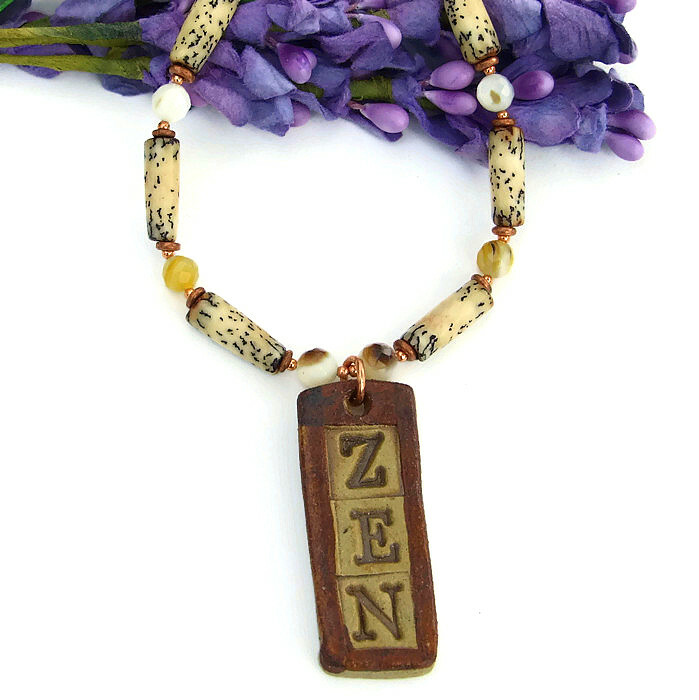 The earthy, handmade necklace, appropriately named ZEN, features an artisan made ceramic Zen pendant with a lovely rustic feel. Spotted palm wood tubes add a fun organic feel while faceted mother of pearl shell gives a sleek look. Together these add more than a hint of yin yang to the design. Copper disc spacers, copper beads and a copper toggle clasp set add beautiful glow. 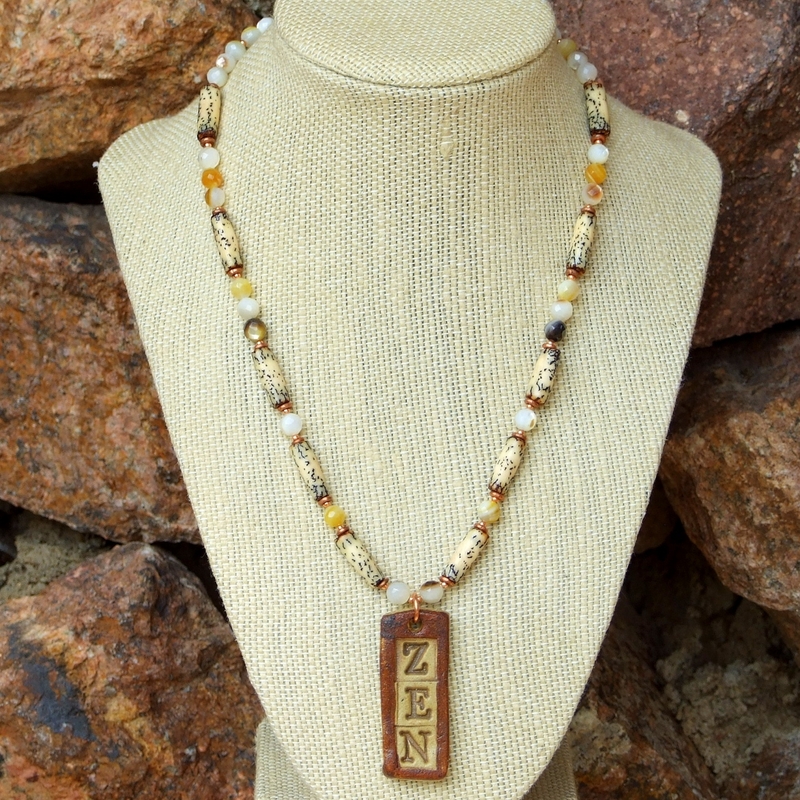 A meaningful gift idea for the woman who loves unique jewelry, the one of a kind ZEN necklace was carefully designed and handmade by Catherine of Shadow Dog Designs. 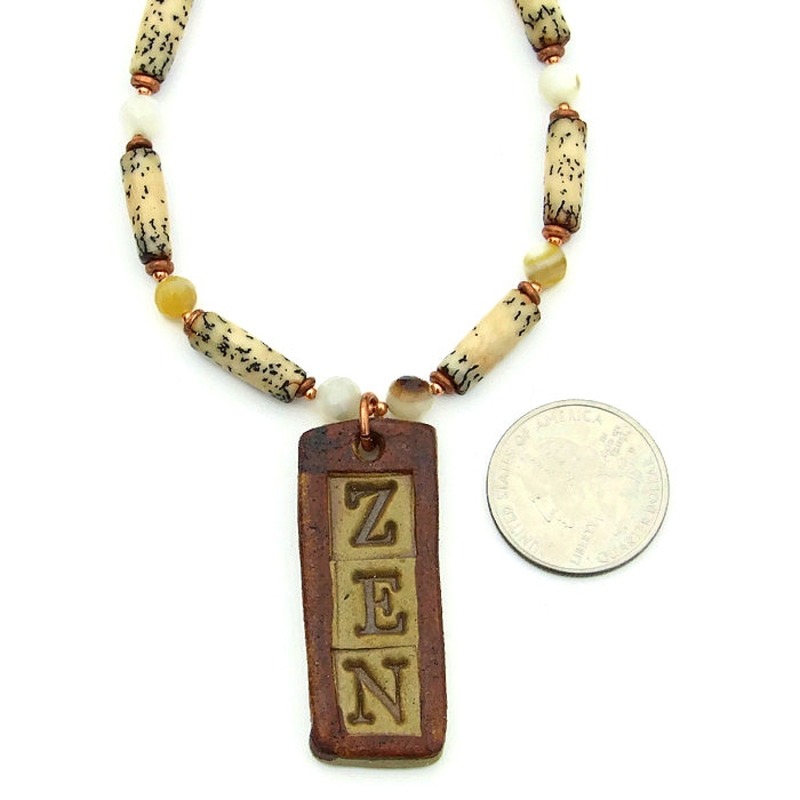 *** For a better understanding of the relative size of the ceramic Zen pendant, palmwood tubes and mother of pearl shell beads used in the ZEN yoga necklace, please be sure to check out photo #6 for a size comparison with a quarter. 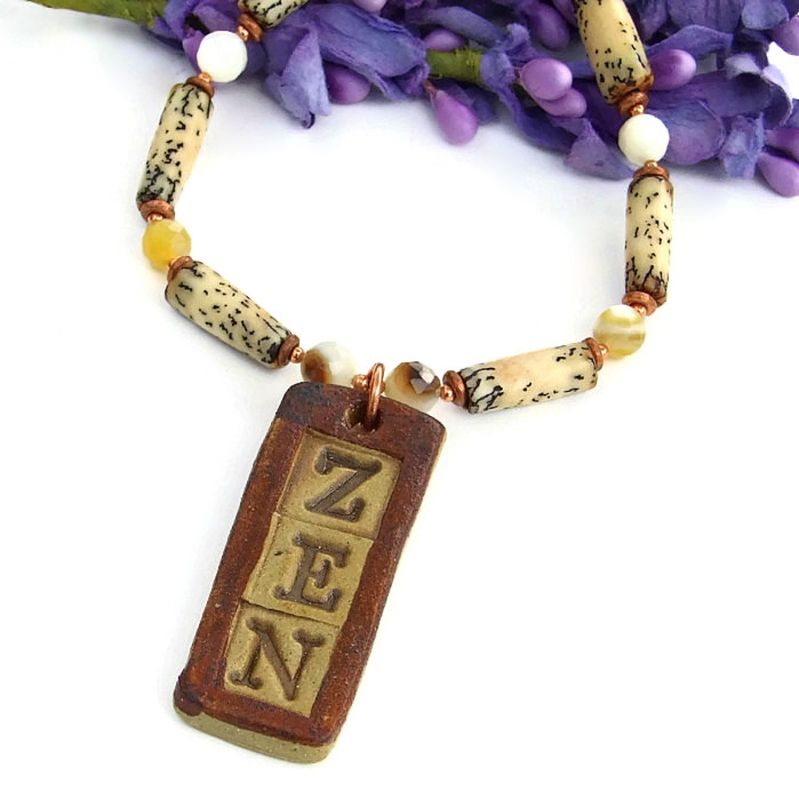 As mentioned above, the Zen pendant was artisan handmade; Tracee of classicbead created the rustic beauty from stoneware clay. 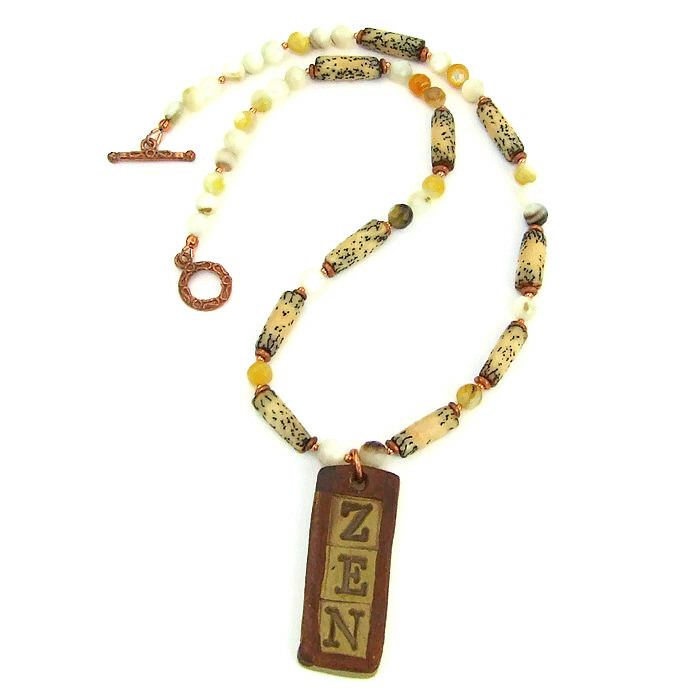 The pendant was shaped and the letter spelling the word Zen were impressed into the clay. A pale beige glaze was to surround the letters. The letters themselves were carefully hand painted with a dark brown glaze, as was the “frame.” The back of the pendant was left unglazed. For strength and durability, the pendant was kiln fired twice. A heavy duty copper jump ring connects the pendant to the main body of the necklace. *** Please note: Even though the pendant is high fired ceramic and very durable, a hard hit can chip, crack or break it. Take extra care when taking the necklace off and laying it down on a hard surface. To perfectly complement the Zen pendant, palm wood tubes and faceted mother of pearl were used. Palm wood has been used for centuries as beads and comes in a wide variety of colors and patterns depending on the variety of the palm tree. 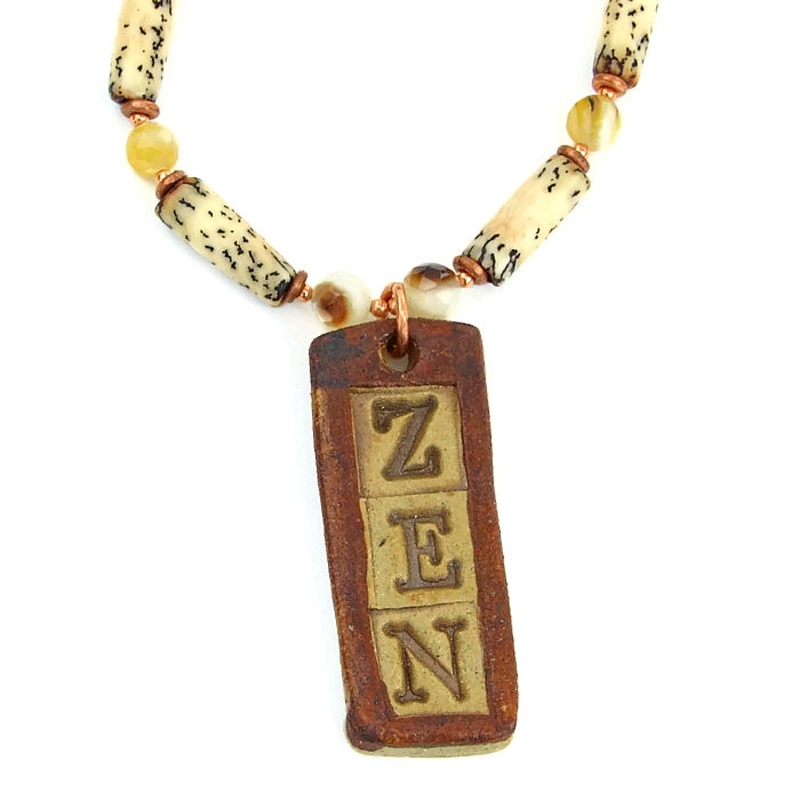 The tubes used in the ZEN necklace have an off white background with very dark brown and black dots. Each tube is unique in its patterning of dots. Between each palm wood tube are shimmering, faceted mother of pearl shell beads. The faceting of the beads gives subtle sparkle to the necklace along with their famous iridescent glimmer. The mother of pearl beads range in color from off white to a mustard yellow to almost black, although most are off white. To add more interest, some of the beads have specks of darker color. Copper disc spacers and small copper beads separate the palm wood tubes from the mother of pearl. The necklace is finished with a copper toggle clasp set with a swirling design on one side. Zen is the essence of wisdom and compassion. Palm wood is said to help the wearer connect to Mother Nature. Mother-of-pearl is believed to enhance personal integrity; it also helps to calms and soothes the emotions. Copper is said to allow the wearer to recognize barriers in the path of personal development. 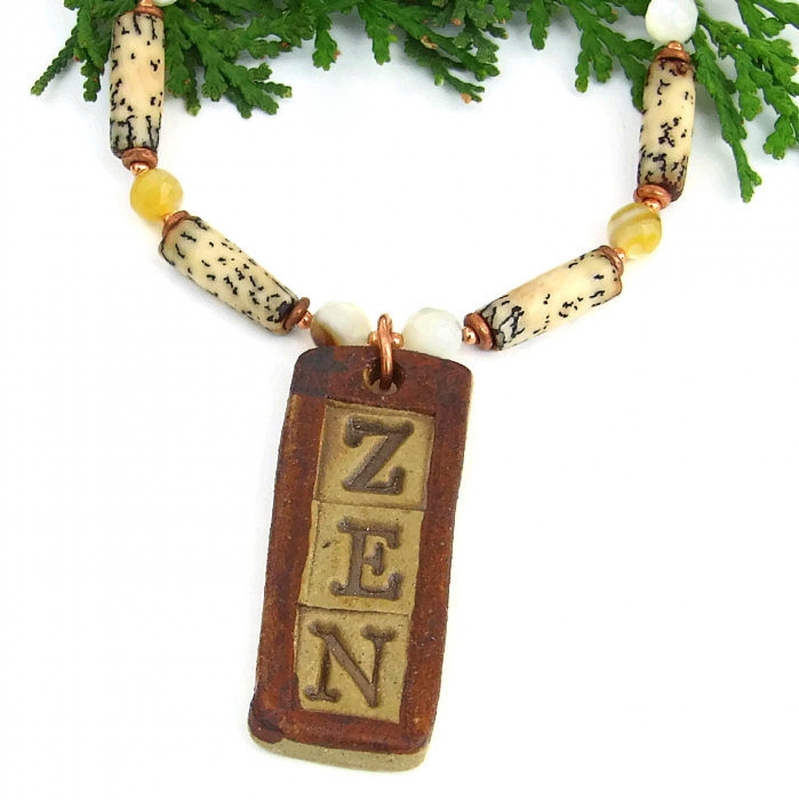 The meaningful ZEN artisan necklace was carefully designed and handmade in a dog friendly, smoke free studio. The necklace will come with two informational drop tags: one with the piece's name; the other lists the materials used in the necklace and the language of the stones and metals. It will be carefully packed in an organza jewelry bag, perfect for gift giving to a loved one . . . or to yourself!